E.F.R - Test and Tag Ballarat provides testing and tagging services in Ballarat and the surrounding areas. 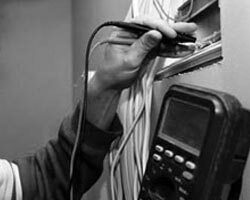 We specialise in testing electrical equipment, RCDs, Power outlets, equipment testing, asset management and much more! E.F.R - Test and Tag Ballarat have had many years experience in the industry, so if you are looking for local, honest and reliable testing and tagging, then look no further then E.F.R - Test and Tag Ballarat. For more information contact us now on 0417 340 467. We Can Also Incorporate Asset Management! Do have information on hand of all your assets? Item $ value, Serial & Model No of assets? Know when items are due for Replacement & Re testing? Are items easily identifiable to you & your staff? EFR Test & Tag have developed our own unique Asset Management System that can do all of this & more for you, combine all these services at the same time & in the 1 neat package! Saving you time, money & frustration. We can even create a managing program for Maintenance Schedule your other equipment including fire extinguishers & even organize for them to be tested, all done for you service!! Saving you even more time & money.